Do you have an issue you want to raise with your elected officials in Washington, DC? 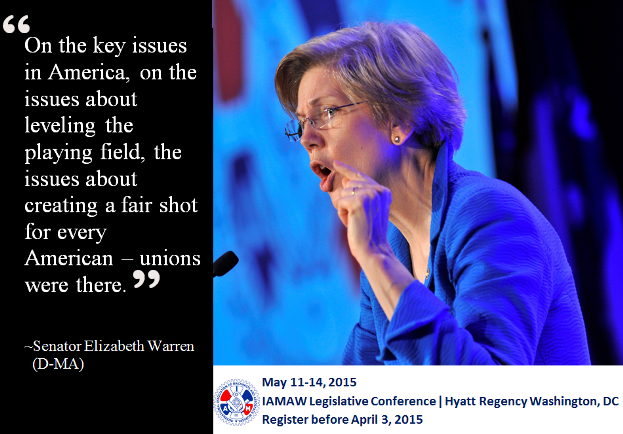 From political novices to seasoned experts, the 2015 IAM Legislative Conference is the perfect opportunity to hear from the most powerful voices in Washington, and lobby your Senators and Representative on issues like workers’ rights, trade and more. The 2015 IAM Legislative Conference is set for May 11-14 at the Hyatt Regency Washington, 400 New Jersey Ave. NW, Washington, DC. The cut-off date for special room rates is April 3. You can reserve rooms by calling the Hyatt Regency directly at 202-737-1234. Download the official call letter for more details on the 2015 IAM Legislative Conference. The conference will open with an address from IAM General Vice President Diane Babineaux on Monday, May 11 at 1:30 p.m. IAM International President Tom Buffenbarger will deliver the keynote address. General Sessions will be held from 9 a.m. to noon on Tuesday, May 12 and Wednesday, May 13. Tuesday and Wednesday afternoons will be dedicated to lobbying on Capitol Hill. For a taste of what’s in store, watch a Machinists News Network video on the 2014 IAM Legislative Conference.